They have come into town and they want to do all the tourist things. I just want to stay in my London ‘manor’ and chill with them. But oh no..they are sick of local and want to do touristy things, so I am now tour guide extrodinaire as well as hostess with the mostest (I wish, much to opinionated to ever be that!). I wonder what would happen if I lived in say…Crewe, or Ashby-de-la-Zouch and there was no London Eye or Tower of London or museums…people who came to visit would have to make cakes with me and help me decide what colour to paint the corridor, instead of running round town spending too much money on bad food and beverages. So we went out yesterday and actually had a really lovely day. I did my best to wear them out, which was easier than I thought as the neighbours had gone away and their teenage offspring sat on their veranda until 2.30am getting roaringly, abusively drunk, so my friends were quite tired to start with, from sleep deprivation. We went to Canary Wharf and the Dockland Museum which is free and immensely informative. There is a section which is done out like an old dockland street with small alleys and houses, and it actually smells authentic too….like someone peed on the floorboards to give it that….latrine-free feel. We then walked down the Thames Path from Canary Wharf to Tower Bridge which was great, and very quiet until we got to the Tower of London which was MOBBED. Tourist hot-spots…to be avoided at your peril! We then hopped onto a train and went to Spitalfields, which might as well have been closed…by then, they were really flagging, so we went home on a bus ( a 10 hour trip though) But no let up today. They are off to the London Eye, and I am not playing. I am staying at home. During our day out, we had some ok food and some really inoffensive food….with no character what so ever. More of that later. One pet hate I have is when places put something on the menu, run out of an ingredient and just replace it with another with out a blinking by your leave! 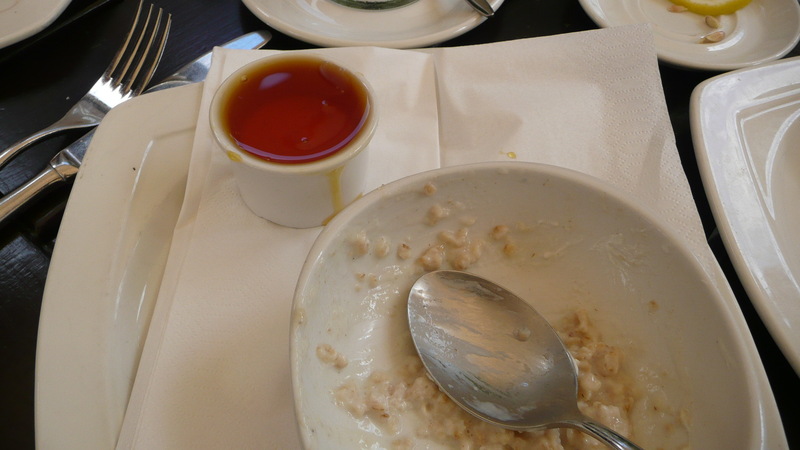 Porridge with Maple Syrup at Browns came as Porridge with some sort of seriously sugary yellow syrup…which is a completely different thing. Maple syrup is the sap from a tree and yellow syrup is just some sort of refined sugar by product. ‘Sorry’ they say when I point out the error, ‘we ran out of Maple Syrup so we are giving you a cheap alternative to it, and we did not bother telling you, because we are assuming you have no sense of taste and would not notice the difference.’ Harsh? I don’t think so when you are paying almost 4 quid for a bowl of porridge, and the difference in price between an egg cup of maple syrup and other syrup would be pretty marked. Interesting that I am talking about sugar which apart from the occasional treat of a bit of maple syrup, I have not eaten for 4 months, and feel much better for it. At the Docklands Museum I saw that in the 1820’s many people in England started to boycott using sugar, because of its link with the slave trade. English ceramic manufacturers responded by making sugar bowls and tea sets inscribed with anti-slavery slogans, though if people were boycotting sugar, I wonder what they put in their sugar bowls? A Birmingham newspaper in Norwich reported “sugar is now positively banished from most polite and fashionable tea-tables” . I shall finish today’s post with a funny by Mr P. during our day out, who when comparing espresso to an americano said that he found espresso a really unsatisfactory drink as he liked to ‘form a relationship with his hot drink’, and there just was no time to do that with an espresso. Oh well, it was funny at the time. More on inoffensive food later. I just really like this track and the video.